Ramy is a technologist, privacy and digital security researcher, who works on the intersection of technology and social causes such as privacy, security and access to information, by devoting his skills as a techie and passion for free/open culture. He engages with human rights initiatives, NGOs, journalists, lawyers, politicians, and artists. In his research he focuses on surveillance patterns and holistic privacy, and in the course of his work over the past 10 years he developed digital security strategies for NGOs and members of the media, as well as rapid response plans in cases of physical threats and operational plans for human rights emergency response teams in Egypt, the Middle East and the Northern Africa Region. Ramy also developed strategies in support of publishing sensitive material and secure systems for managing information about sexual violence and torture survivors. He also contributed to the testing of privacy apps, the localization of few privacy apps into Arabic and the development of organizational privacy protocols. 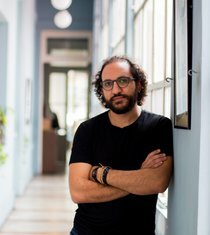 In October 2017, Ramy received the international award Heroes of Human Rights and Communications Surveillance, "for exhaustive efforts to reveal invasive and harmful surveillance tactics that are being used to harm users at risk. ", by Access Now. In May 2016 he received the international Bobs Award - Best of Online Activism in recognition for his work in digital security and privacy. In January 2016, he was named in the World Top 100 Info Security Influencers list by CISO Platform in India. In 2012, he was ranked number 10 by the Newsweek Magazine in the Revolutionaries list of the Digital Power Index, after being ranked number 14 by Forbes Middle East in Top 100 Arab Presence on Twitter a year earlier.